Question #1 – If deleted, will the reader still be able to follow the story? If yes, you’ve got filler! Question #2 – What is different by the end of this scene? If nothing, it’s filler! Question #3 – What/Who does this scene affect? If nothing/nobody, it’s – you guessed it – filler! If even one of these questions results in “filler”, the scene should be cut or revised. But how do you know which option to choose? That’s the issue I’ve encountered as I write and revise the outline for my WIP. I never create totally inessential scenes, and if a scene is two-thirds of the way there (i.e. satisfies two of the three test questions), my instinct is to revise not cut. Sounds reasonable, right? Sure, but I found my story dragging anyway. If I’d revised them into fully fleshed-out essential scenes, why did they still feel like filler? 1) How important is this scene to the hero’s goal? Does this scene address the main story problem? For example, in my WIP the heroine is cheating to boost her grades high enough to get a college scholarship. After she gets caught, I had a scene in the Principal’s Office where her punishment is doled out. However, the heroine doesn’t care what her punishment is; all that matters is that she was caught and can’t use her conventional methods of cheating anymore and has to find another way to succeed. So though this plot point (getting punished) needs to happen, it doesn’t have to happen onscreen, so I cut it and covered the information via some quick exposition in the next scene. 2) Does this scene hinder the story’s pacing? Something else I noticed about the above scene is that it delayed the story’s Inciting Incident. Even as I was writing it, my inner critic was like, “Get on with it! Get to the Inciting Incident faster!” Cutting this scene facilitated that. 3) Are you trying too hard to make this scene essential? This is my downfall. As I mentioned, if a scene is two-thirds of the way there, my instinct is to add something to make it complete, and I found myself creating an unnecessary subplot in order to add more conflict and change to the Principal’s Office scene. At first I thought this was brilliant, and a day later I realized it violated question 1 and 2 of this list – it was not important to my heroine’s goal and it slowed down the pacing. So what I’ve learned this week is that if a scene fails the No Filler Test, more often than not the scene needs to be cut not revised, and its important information redistributed to other scenes. Now to go apply this to my WIP! A great blog with so many useful tips! I am following it now and thank you for posting these! Thank you so much! I will be writing these 3 questions down on a piece of paper and pin it on my wall when I get to that editing stage. Fantastic! Thanks for commenting, Ellie! Thank you so much for this article! 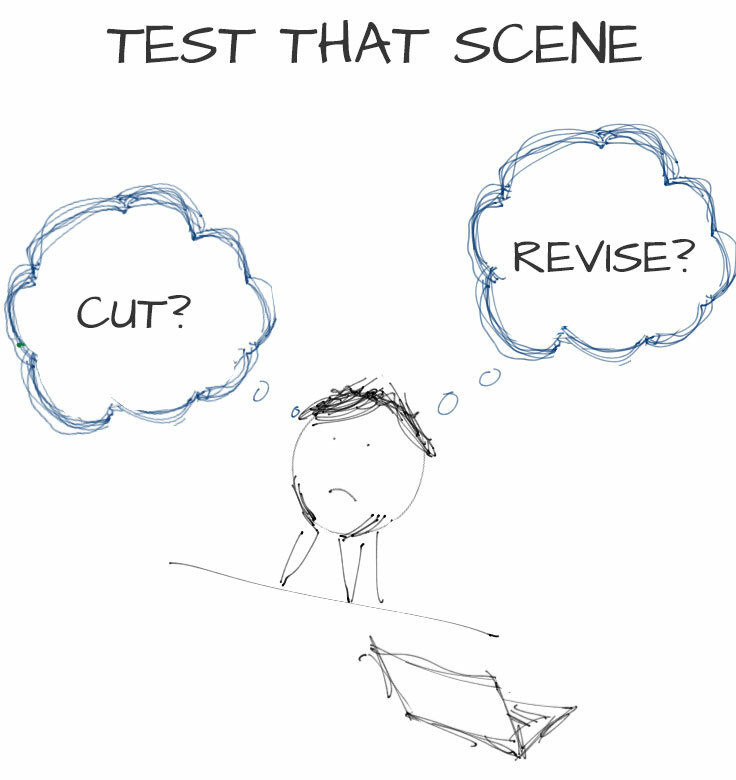 It helped articulate to my poor brain why I was failing at a scene I’ve been working on! I love your blog and am enjoying reading your posts like the stalker I am! Thank you again! You’re very welcome! So glad the blog helped you solve the scene problem. Thanks for the lovely comment! This is very timely and informative advice! I’m at the editing stage of my novel and it desperately needs to get cut down, but I’m so attached to some filler scenes that it’s hard! I always think when I become famous I can release a “Deleted Scenes” section on my website LOL! That’s a good idea! Keep them for bonus scenes to release to your legions of fans! Actually, movies do that now. You can go online and find all kinds of cut scenes from films. Thanks for the comment, and happy editing! I love this post. I often struggle with cutting scenes, because like in the scenario you describe above, they don’t feel useful but at the same time, an element of them is needed. I love the idea of not using the scene but working in the outcome in a different way. The example really helped make what you were saying clear. Thanks, Debbie! Glad I’m not the only one who struggles with this. Hopefully now we can both cut with confidence! Me too! But sometimes it’s hard for a writer to tell the difference when they’re so close to the story. As usual, excellent tips, Heather! Here’s where I find creating a beat sheet for scenes essential to the planning process. What do you think about planning scenes in advance, or going through your novel once it’s complete and creating a beat sheet to ensure every scene has a mission that drives the story forward? With my last novel I did the latter, which was a lot of work, but well worth it. With my WIP I planned my scenes in advance, and I can honestly say I LOVE it. As a reformed pantser I’ve evolved into an extensive planner, something I thought wouldn’t happen in a gazillion years. I have a not-so-secret secret… I AM writing a beat sheet and applying these questions to it right now! That’s just how I write. I realize lots of writers will ask these questions after a draft is written, but I apply them to my Beat Sheet and Scene Outline. Once the outline passes the No Filler Test, I start writing. You know, Sue, I do both. At least for novels. First I write an extencive synopsis of the story (because I’d never be able to write the novel directly, it’s too confusing for me). Then I write the first draft. And then I write a beat sheet to give the first draft a form. It is a lot of work, but it works for me. And I feel this helps me focusing on what’s really useful to the story and the place every scene should have. This is great! It gives a really good set of things to ask about a scene, chapter, etc. This will be really helpful when I get back to writing my sci-fi book. What I’ve found informative and helpful of late is using screenwriter’s tools to help write my scenes for my cozy mysteries. We were all raised on movies and TV so that comes as a natural story telling tool. Oh, and great post, by the way. Thanks! I was trained as a screenwriter, and yes, when deciding what scenes to cut or not, picturing my novel as a film helps. When I did that, the Principal’s Office scene became a quick, wordless shot, just to establish what we all know is happening, and that’s it. It also helps to think like a Producer and ask, “Do we really need to spend money building that set or hiring that actor for that scene? Can we make the movie without them?” If yes, cut! Great questions to ask about a chapter, and about certain scenes within a chapter, too. I’m working on a difficult chapter with a friend, and I wrote not one but THREE transitional chapters for my current story. I could tell as I was writing them that they lacked the energy the other chapters had, and it was really me struggling with not knowing how to move the story forward. I wrote them and moved on, knowing I’d come back and either hack them to pieces or delete them entirely once I finished the story. They’re on my to-do list. These questions you’ve raised will help tremendously in seeing the actual role of those chapters! The friend I’m helping, we separately color coded the tricky chapter into sections we thought were fine, sections that were okay, and sections where there were problems. Wherever we both identified a section as problematic, these questions will be the first step in the rewrite process. Great stuff, as always. Thanks! So glad to hear these questions will be helpful to you during your revision. Yay! Good luck and happy writing!